If you had a loved one, gravely ill in a hospital, how much would it mean to you to see him or her smile? Liz Wilson has seen just that many times, witnessing a hospital stay brighten because a door opened and in walked — not a doctor — but a comforting visitor with four legs. Hand in Paw 2015 from Alabama NewsCenter on Vimeo. That’s the business of Hand in Paw, a Birmingham-based animal-assisted therapy organization that provides such visits free of charge in hospitals and other medical facilities, said Wilson, associate director for the organization. But the animals and their handlers go far beyond medical settings, bringing the value of interactions with trained, friendly pets into settings as diverse as schools and homeless shelters. HIP got started in 1996 through founder Beth Franklin’s interactions with the court system. At the time, Franklin was the executive director of the Birmingham Humane Society, Wilson said. That was “a win-win,” Wilson said. 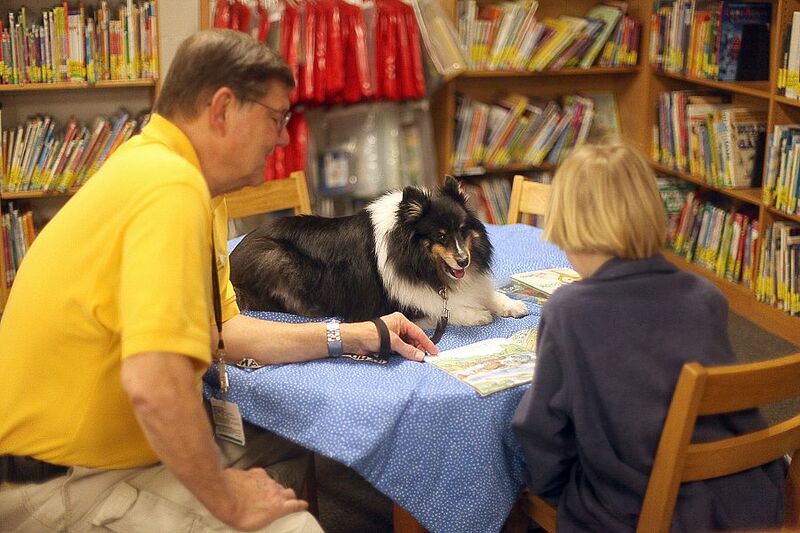 Cooper, the therapy dog, and his partner Lee engage in a literacy program – Sit, Stay, Read – at Hall Kent Elementary School. Franklin went all-in — cashed in her retirement, sold her home and, making her own dog Jessica the first therapy dog, started a new nonprofit. Today, Hand in Paw (HIP) boasts about 150 teams of handlers (some as young as 10) and pets. “They go out to 90 different sites throughout four counties,” Wilson said. “Last year we made 97,000 interactions — visits with individuals. 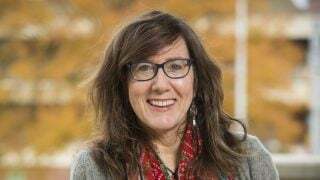 And that was about a 25 percent increase over the previous year, so things grew very rapidly these past few years,” she said. People see the handlers and pets — most are dogs, although there is one cat, a guinea pig and two pygmy goats — around town. They’re recognizable because the animals are wearing yellow kerchiefs and the humans are in yellow shirts. HIP, by the way, has also had rabbits and currently has a llama in training. 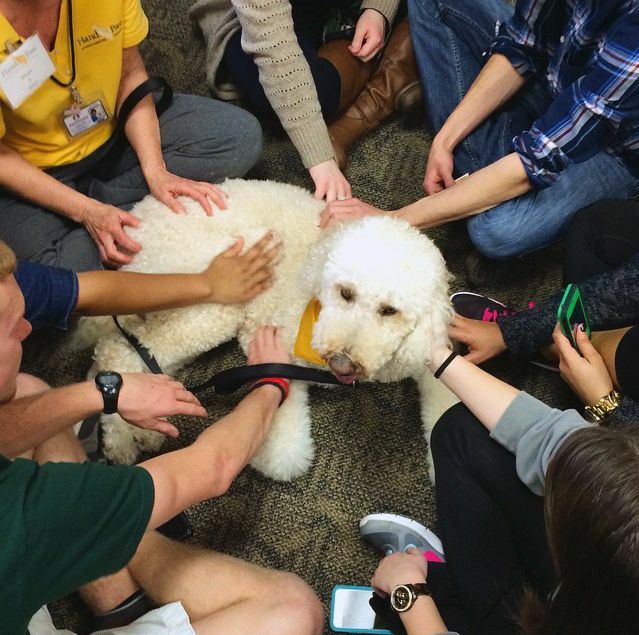 Students at UAB enjoy an Exam Week Stress Relief Break with HIP therapy dog Simon. A patient who may not want to walk down the hall to get the exercise therapy he needs may change his mind when given the chance to walk with a friendly golden retriever, Wilson said. 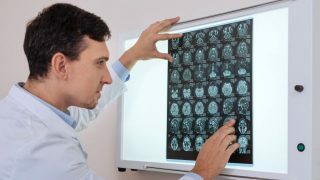 “They’re much more likely to say ‘Yes.’ In fact, there’s a study that says they’re twice as likely to say ‘yes’ and that they also walk twice as far as they walk without a pet,” Wilson said. Besides hospitals, HIP brings animals into a variety of schools and human services agencies, including shelters for the homeless and victims of domestic violence, group homes and facilities that cater to people with differing physical, emotional or psychological needs, including the YWCA. “You name it we probably have a program there,” she said. People across the spectrum of agencies bond with the animals. HIP teams visit some sites several times a week. 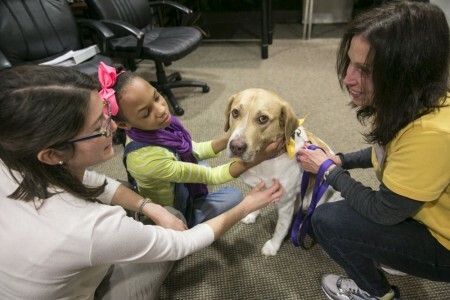 The radiation oncology center at UAB actually gets daily visits — different animals each time. In some cases, the teams from HIP work with occupational or physical therapists. “In those settings, it’s critical that we are working with the repeat patients so that they build rapport with the human-animal team, so that they relax and get really motivated about them coming, and they’ll work harder with them in therapy,” Wilson said. Before a team can work with HIP, the animal has to be at least a year old and has to have lived with the owner for at six months. Dogs have to have completed a basic obedience course and up front, all animals are tested for their temperament, to make sure they can interact in a good way with the people they will come into contact with. Lisa, a HIP volunteer, and her dog George take HIP’s No More Bullies program to children at Big Brothers Big Sisters of Greater Birmingham. Training involves exposing the animals to wheelchairs, walkers and other items that mimic a medical setting, Wilson said. Handlers are given training as well to take their animals through revolving doors and onto elevators and other real-world situations. Pets are limited typically to just one visit a day. All of Hand in Paw’s services are free, paid for by donors and grantors, Wilson said. “They are giving the gift of animal therapy to the Birmingham community.” HIP also has fundraisers throughout the year that help cover costs and keep the programs free. 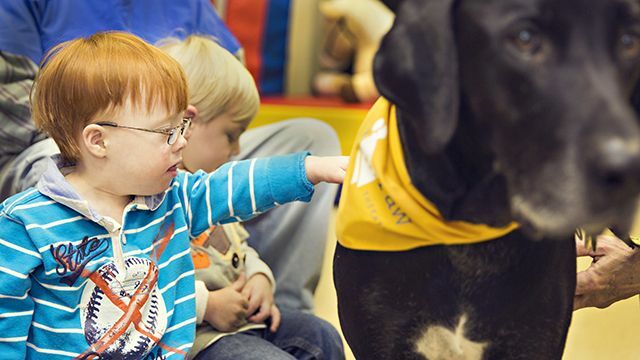 Although HIP is a Birmingham-based organization, it follows the standards of an older national group called Pet Partners. “We use their training materials, and their testing materials, and register our teams through Pet Partners,” Wilson explained. “We have a lot of additional standards and training added on to Pet Partners, things that are more specific to our programs and our community partners in Birmingham. But those national standards give those community partners a degree of comfort.” HIP also is affiliated with IAHAIO, the International Association of Human Animal Interaction Organizations. If you and your pet are interested in volunteering, Wilson said, the first step is to look at www.handinpaw.org to better understand the prerequisites. The website also has an online application.